This past summer I spent a few weeks in Greece. I fell in love with the country, the people and the especially the food. 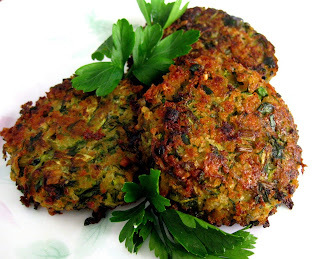 One of my favourite things to eat were these wonderful and simple zucchini fritters called Kolokithokeftedes. This might be my favourite way to eat zucchini now. 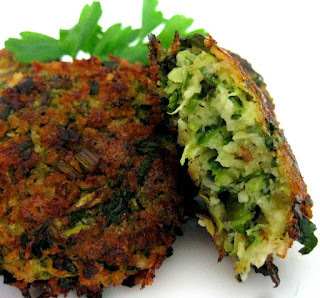 The original recipe had baked the zucchini fritters but I prefer to fry them.....a little more naughty but well worth the indulgence. Enjoy! 1. Rinse your zucchinis well and snip the ends off. Grate the zucchinis through the large whole of your box grater and place in a colander (with a bowl underneath). Sprinkle with some coarse sea salt, cover and place in the fridge for at least 3 hours. 2. Squeeze out as much water as you can with your hands and then place handfuls of the grated zucchini in a tea towel and ring out as much water as you can. Place in large bowl and repeat with remaining grated zucchini. 3. In a small skillet, add a couple of turns of olive oil add your scallions and garlic into a skillet over medium heat. Sweat the scallions & garlic for about 5-7 minutes. Allow to cool before adding into the bowl with the zucchini. 4. Add the cooled scallion mixture, beaten egg, chopped herbs, breadcrumbs*, crumbled Feta , grated Graviera, black pepper and mix with a spatula. If the mixture is too coarse, get your hands in there and mix them well. If the mixture is too dry, add a little olive oil and if the mixture is too wet, add some bread crumbs. Mix again. 5. Grab a small handful of the zucchini mixture in your hand and roll into a ball and then flatten into a patty (you may at this stage fry-off a small patty to taste and adjust seasonings to your liking). Make all the patties before frying. 6. While forming the patties, heat 1/2 inch of oil in a frying pan. Over medium heat, fry each patty until it's golden on both sides (approximately 3 minutes per side). Remember to not over crowd your pan or the patties will take longer to fry and become greasy. Transfer patties to a paper towel lined plate. Keep warm. 7. Serve warm on their own or with a cool dipping sauce: Take some Feta cheese and mash it with a fork and then add some Greek yogurt, a little bit of water or vegetable stock, some minced garlic, salt and pepper to taste and a sprinkle of paprika. NOTE: * for the breadcrumbs, place some crustless bread in a food processor/blender and pulse until you have crumbs. Wow, Paula they look super delicious. I will have to try them soon. My garden yielded a ton of zucchini and even so this is still my favourite way with it. Your kolokythokeftedes are simply delicious!!!! !